Probably the most common injury/issue I deal with as a yoga teacher is low back pain. While there are plenty of good physiological reasons for this state of affairs (i.e. sitting all day at computers) I’m coming to believe that psychological factors play the bigger role. In fact, after reading Judith Harris’s book Jung and Yoga: The Psyche-Body Connection, I’m coming to think that our current epidemic of ‘bad backs’ boils down to a spiritual disorder. 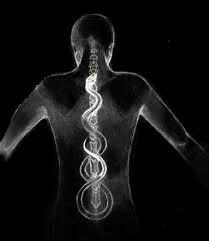 The spine actually divides, at the waist, just above the sacrum, to make this elongation possible. In Hatha yoga this lengthening and stretching of the sp ine was critical to spiritual development, opening the body to the free flow of life force energy (prana) stimulating power centers (chakras) and pathways (nadi’s) and ultimately allowing spiritual energy (kundalini) to rise up from the tip of our tailbone to the apex of the brain. 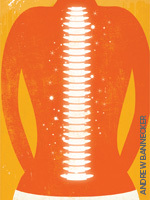 Hatha yoga calls the sacrum a sacred or holy bone, because it is the center of the divine body. 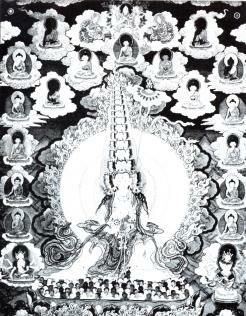 Because it literally connects the lower half of our body to the upper half, it is seen as a place of transformation, where the union of upper and lower, of above and below, of the divine and the human occurs. 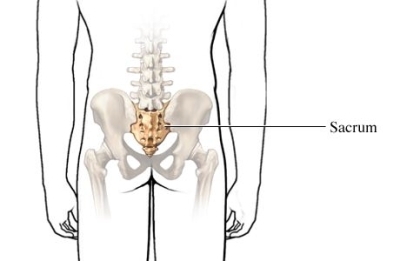 That’s why I find it fascinating that most of our lower back issues are rooted in this ‘sacred’ area. Telling also, is the fact that for the vast majority of back pain cases, a specific physiological cause or source will never be identified. Have we, as Harris asserts, become so ‘frontally’ directed towards getting ahead, that our back, the sacrum -our root and center – has fallen into the dark, the unconscious? Have we forgotten the necessity of balancing heaven and earth, of finding both the sacred and corporeal within ourselves? I find it revealing that my own lower back problems vanished when I committed to becoming a yoga teacher. This decision marked my step back from an overly rational way of seeing, from materialistic concerns, to believe in well, something – anything. I’ve always thought my back pain faded because I re-educated my body through training in proper alignment, but now I’ve begun to wonder if it wasn’t my commitment to a more spiritually oriented life that ‘cured’ me. Just wanted to tell you as a psychiatrist , a Christian and an avid yoga practitioner , that I loveyour columns . Everyone has been talking for the past decade on understanding the Body-mind-spirit connection but your posts really push the dialogue into a very concrete practical space. Thanks ! What a wonderful offering. I have sent this beautiful explanation of the sacrum and spine to my students who have been working on finding the connection between heaven and earth. Thank you for the thoughtful description. I have that problem of thrusting my neck forward – and I always wondered why I did that. Thank you for the post. 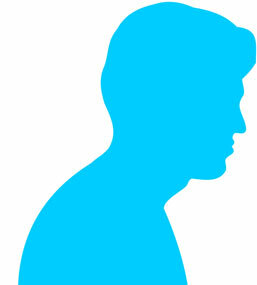 The body mind connection is for sure very powerful, by observing someone posture and movement you can found out habits and main characteristics of the person in front of you i.e. introvert or extrovert, reserved or self confident etc. this connection (through nerves) is two way either the body sends information to the brain or the opposite, so if you tackle the problem from outside i.e. posture and muscles or though inside i.e. attitude, thoughts etc. the ending result will be the same; no matter from where you start the other will catch up e.g. smiling without feeling you will end up feeling happy at the end. Wonderful thoughts here, Danielle. I have a soft spot for the space where sacred meets secular myself. When I was reading your 14th paragraph (3rd from the end up), I thought I was reading myself writing. Unbelievable! The same thing happened to me. The only difference was that first I committed to practicing yoga for 10years, now I finally stepped up to be a yoga teacher and share this wonderful expansiveness we gain from yoga. I find it fascinating that so many yogis and yoginis come to work on the physical and get the spiritual as bonus without even noticing! Thank you! Great post. My late mother was a yoga teacher and these were her thoughts. Would you recommend purchasing it? I had quite an unusual start to my adult life, involved in a religious organisation. When I left I suffered from lower back pain which I am now convinced is due to psychological truma. It is as if we hold on to things, situations, fellings in the sacrem and we find it hard to let go. Coming from a spiritual background yoga has helped me find my true self and now I am on a yoga teacher training course.